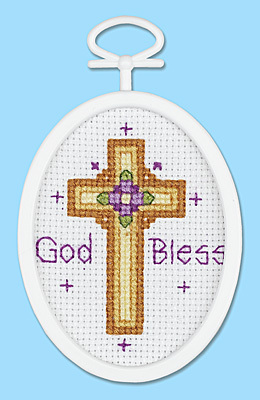 Create this inspirational cross stitch design for yourself or someone close to you. Each kit contains 18-count white Aida fabric, 6-strand cotton floss, frame, self-adhesive mounting board, needle, graph and instructions. Size: 2.25" x 2.75" oval. Janlynn Ready, Set...Stitch also available in select Walmart Stores. Click here to find this product in a store near you.